A new opinion poll among Russians who took part in Moscow protests against alleged election fraud shows that most still want the authorities to hear their demands, while less than a third say there is simply no point in dialogue. 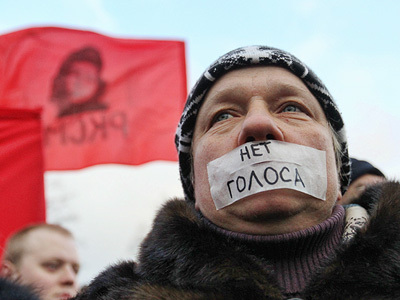 The poll conducted by the WCIOM public opinion center showed that 57 percent of those who took part in the February 4 rally in Moscow’s Bolotnaya Square support dialogue between authorities and opposition, while 29 percent of respondents said that dialogue is pointless. 14 percent of those polled said it was difficult for them to assess how useful such dialogue could be. The protesters’ opinions also varied widely on who they see as the preferred candidate to represent the opposition at talks. 25 percent said they want to be represented by the former leader of the Yabloko party Grigory Yavlinskiy. Yavlinsky tried to register for the forthcoming presidential election, but was denied registration for presenting forged signatures in his support. 16 percent said they would prefer to be represented by the leader of the Liberal Democratic Party, presidential candidate Vladimir Zhirinovsky. The same share said they want to be represented by blogger Aleksei Navalny – a relatively new figure in politics, who gained popularity through his anti-corruption campaign on the internet.Independent presidential candidate Mikhail Prokhorov was supported by 14 percent, and only 10 percent said they want to see the Communist Party leader Gennady Zyuganov as their representative. The leader of the Fair Russia party, presidential candidate Sergey Mironov was even less popular, with only 3 percent. Asked who they will vote for in the upcoming presidential election, 27 percent of protesters picked Prokhorov, 15 percent support Zyuganov, 13 percent will vote for Zhirinovskyand 10 percent – for Mironov. Unsurprisingly, only three percent of protesters said they were planning to vote for Vladimir Putin. 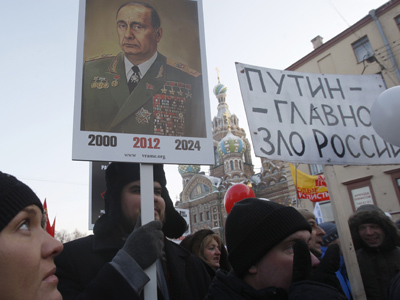 Furthermore, 53 percent of protesters told the pollsters they are sure the majority of Russian citizens do not support Vladimir Putin as a presidential candidate. 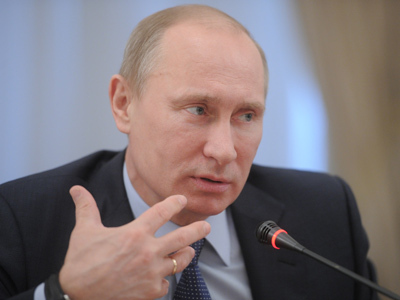 16 percent think Putin enjoys the support of the majority of the population, and 23 percent hold that Russians are indifferent to Putin. At the same time, 44 percent of protesters say Putin will win the election, and even more respondents – 50 percent – said they expect the elections to be rigged.47 percent hold that violations will take place but will not be massive, and just 1 percent said they expect the elections to be absolutely honest. 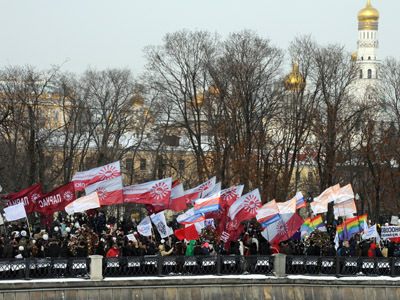 Vladimir Putin invited the fringe opposition to take part in a dialogue in late January, after the first string of protests triggered by December’s parliamentary election. The opposition leaders have split in their assessment of the offer – some doubt its sincerity, while others have voiced enthusiasm. So far, no one has given an official reply to Putin’s offer, and no meetings are scheduled.